Downtown Reno is going through what can only be referred to as a renaissance. A true renaissance doesn’t happen very often in American cities, maybe once every forty years, or even fifty or sixty. But it’s undeniable that one is going on right now. It’s something that has been building up for a few years now, and has really launched to atmospheric heights in the last 12 months. And it can’t come soon enough. For the last decade downtown Reno has been on the decline, with the really large casinos like Circus Circus, Harrah’s, and Silver Legacy (which turned 10 last month) doing really well, but all the smaller casinos fighting to stay alive. This is an age where it’s more lucrative to run a pawn shop on Virginia Street than a casino, as you can see by the closure of small places like the Horseshoe and the Gambler/Rocky’s. Where huge hotel towers sit vacant, or are turned into weekly rentals for low-wage workers and transients. Where there are whole parts of town that nobody goes to, or if they do it’s just because you have to pass through there to get somewhere else. Reno’s heart is no longer in its downtown; it has shifted elsewhere, and left downtown to rot. But in the last year, some serious money has finally started flowing into downtown. And it’s not in the form of new casinos, or new hotels, or anything else Reno is known for. No, there’s a new way of making money in Reno, and there’s just one word that’s buzzing on the lips of every developer in town. The Comstock Hotel. The adjoining building (with the dark windows) is the Plaza Resort Club, not part of the renovation. The Comstock Hotel Casino, at the corner of West and 2nd Streets, was one of the first properties to be considered for conversion to condominiums. 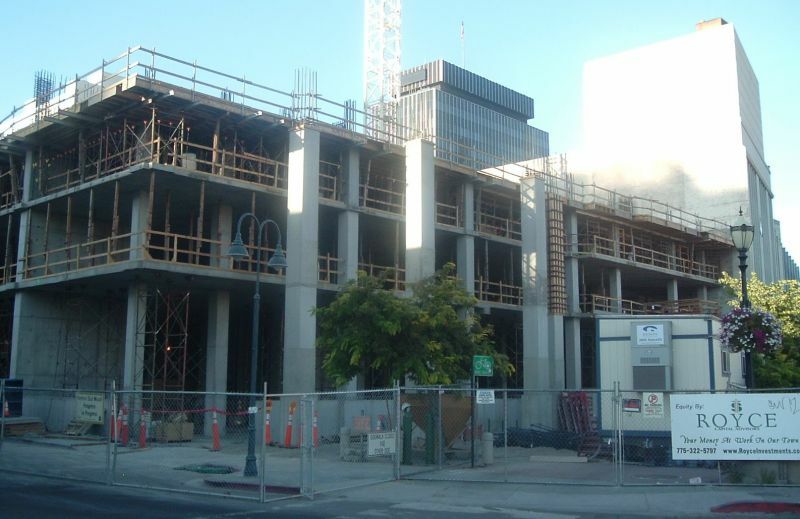 You could say that this was the project that launched Reno’s current condo boom. It will also be the first one that will be ready for people to move in. Scary-looking balconies are being added to every room. The Comstock had a heyday at one point, I’m sure. 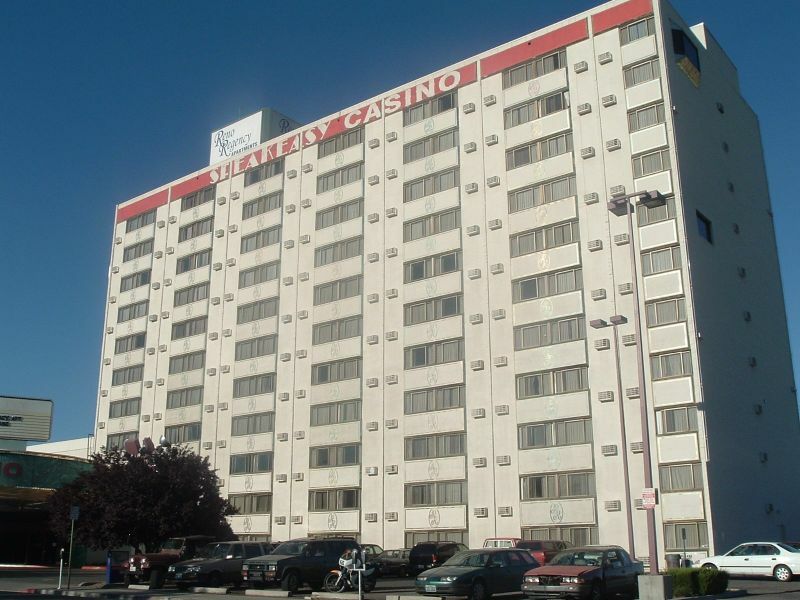 It was one of Reno’s largest hotel towers when it first opened, in a good neighborhood, and you could generally have a good time there. Even as recently as the 90s it was still being renovated, with giant neon starbusts installed on the outside of the tower so Reno could have a fireworks show every night. (Check that out here and here.) Well, that was a long time ago. Since then it has been in sharp decline, in its later years turning into little more than a flophouse. And that was one of the more polite names you could call it. This article kind of drives home how horrible it must have been for a family to have to live there, in the final months before it closed. But close it did, in May of last year. That’s when, after years of people talking about redeveloping Reno, one developer stepped forward to actually do it. That one move was the catalyst that sparked others, at least eight others, and it’s about to pay off. 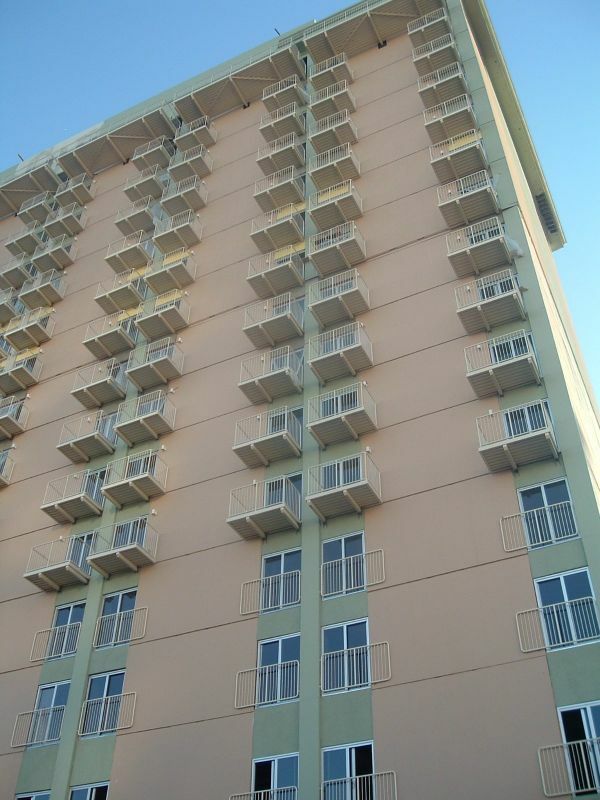 The “Riverwalk Towers” is supposed to be available for occupancy sometime in October 2005. All the units have already been sold. The Sundowner’s big, south tower. 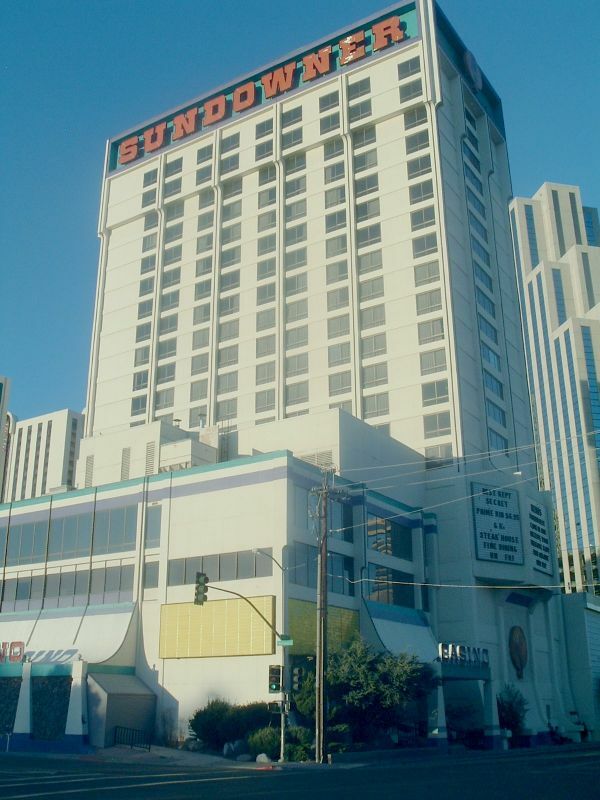 The Sundowner was always an overlooked hotel/casino, sitting as it did a few too many blocks away from Virginia Street. So it wasn’t any surprise to see the building eventually shuttered. But, soon after the closure, the conversion project over at the Comstock started to get underway. And it wasn’t very long before a similar announcement came about the Sundowner. Now the building has been rechristened the “Belvedere Towers”, and construction is progressing very nicely on the inside, even if there isn’t any outside progress to be seen. There are actually two towers here at the Sundowner. The south tower, which is the tallest and most visible, is actually going to be the second one to be worked on. All the action right now is happening in the north tower. The plan is for both hotel towers to be converted to condos. If the venture turns out to be a success, they are already drawing up plans for a third, brand-new, tower to be built across the street. 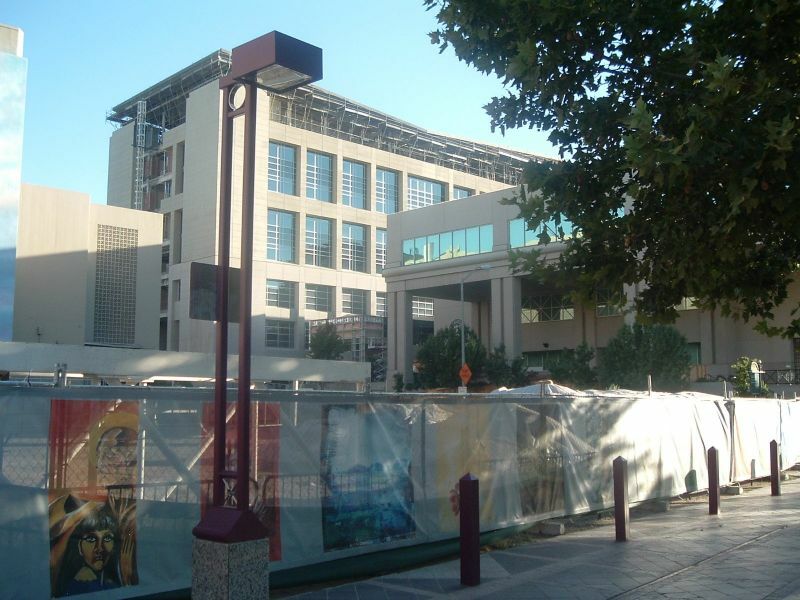 Palladio construction as of August 31, 2005. 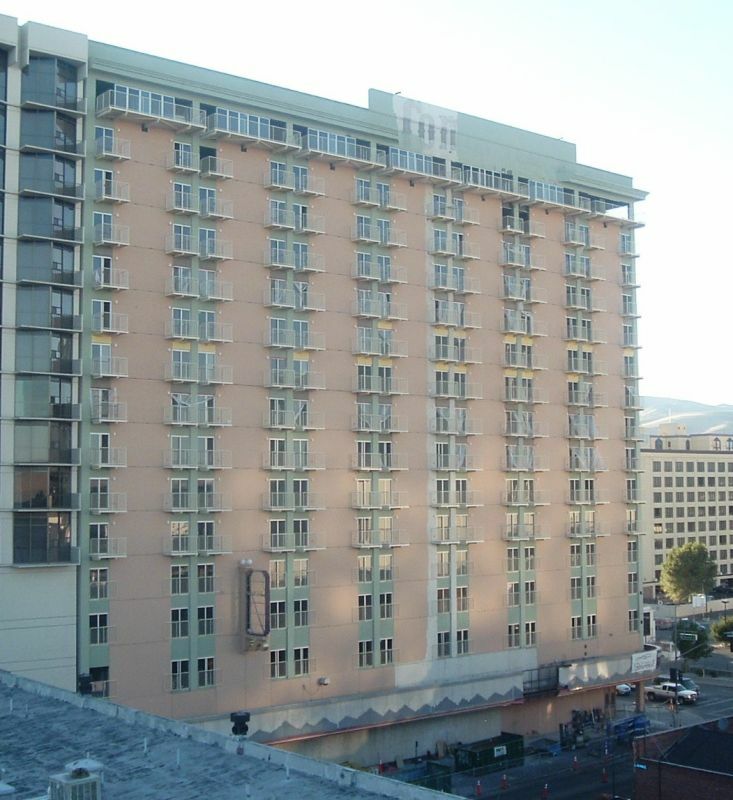 The Palladio is one of the first projects announced that would actually bring new construction to downtown Reno, rather than renovating an existing hotel. In fact, construction is already under way on a 13-story tower right on the banks of the Truckee River. An executive summary on the project can be found here (196kb PDF). When completed, the lower four floors of The Palladio will be filled with parking and retail/office space, and the other nine floors will be condos. These places are going to have one of the best views in the city, looking down on the Truckee River and across to the Sierra. At least, the south-facing units will have the view. 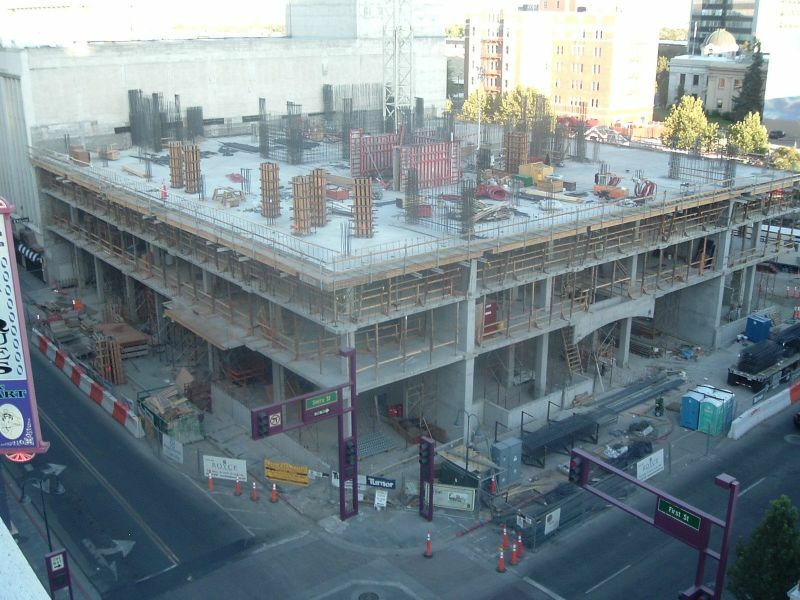 North-facing units will get an eyeful of a practically deserted block of downtown Reno. I wonder which units are selling faster? The Palladio’s lot is at the corner of First and Sierra Streets, on the site of the historic Granada Theater. This whole half of the block was torn down in the mid 90s, when there was a lot of demolition going on along the river. The block directly to the west was levelled around the same time, but it was lucky enough to see new development almost immediately. A Century Theaters now sits there, along with a public plaza. Diagonally across the river, to the southwest, a department store was demolished and a new courthouse built. But this lot right on the Reno Riverwalk, and the one directly across the river to the south, have both been empty for years. Now they’re both finally being developed. This the lot directly across the river to the south of the Palladio. This lot formerly housed part of the Riverside Hotel/Casino, but this half of the building was torn down in the 90s. The historic Riverside Hotel tower still sits right next door. Right now this lot on Sierra Street is still empty, but this is the future home of the Chambolle, sister project of the Palladio. They are both being built by the same developer, so I think that they’re putting all their energy and time into the Palladio right now. Once that building is further along, they’ll be able to start on this 10-story condominium tower. In the background you can see Reno’s new court house rising up. It should be completed in a couple of months. A prime piece of real estate right on the Truckee River, this lot has been home to an abandoned motel for as long as I can remember. It apparently was called the River House motel, and the name Bundox comes from the restaurant that was attached. They both closed in 1989 and were razed in 2002. You’ll have to excuse the crappy picture; it’s the best one I was able to find. This spot of land is now set aside for one of the most striking condo projects on the books yet, designed by architect Carlos Zapata. It consists of two glass towers, one at each end of the lot, with retail and restaurant space in between. If everything goes as planned, it will open by 2008. Grand plans for the river front. 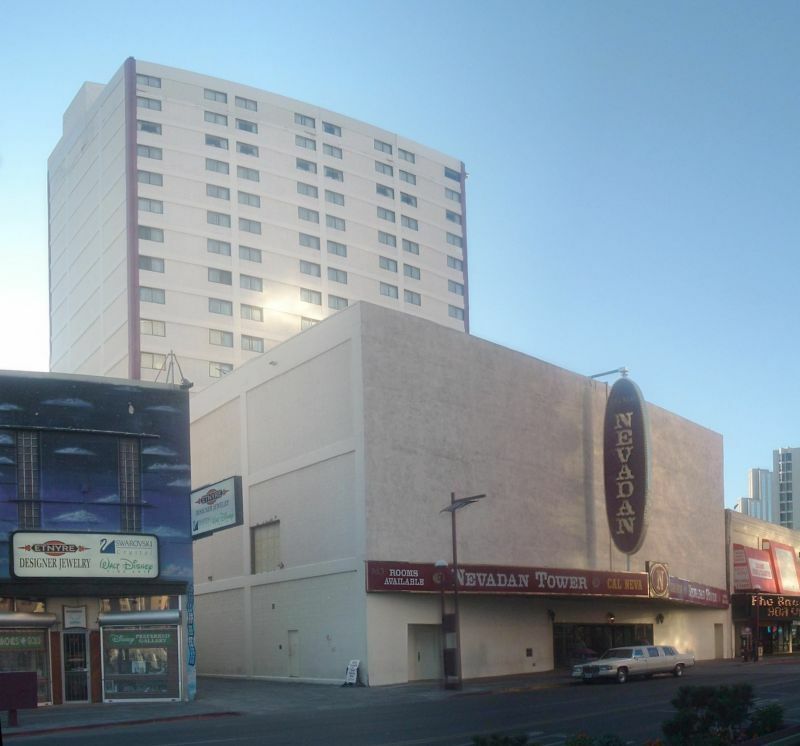 This large hotel on Sierra Street was originally the Sahara Reno, but spent most of its life as Reno’s Flamingo Hilton. The Hilton had a tiny casino on Virginia Street, and if you walked way to the back of the casino, up an escalator and past the restaurants, you would end up crossing a bridge over Sierra Street that would take you to this behemoth. 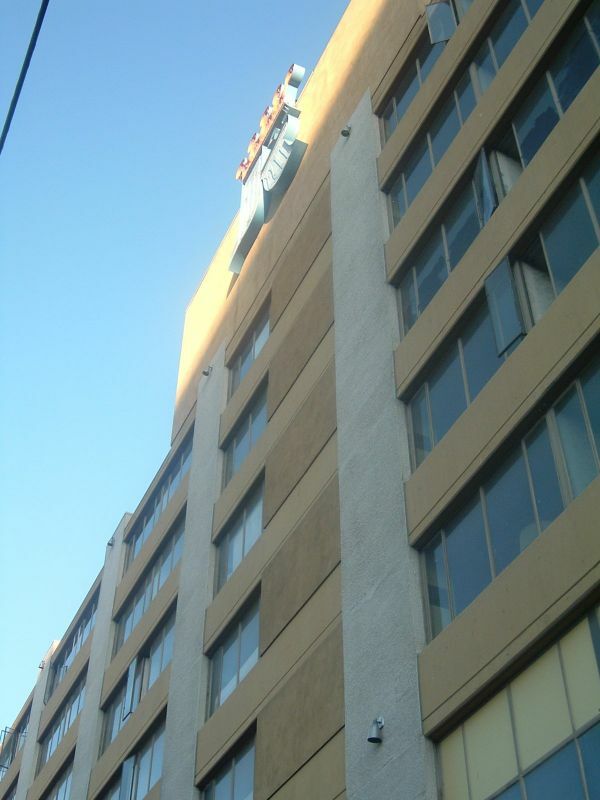 In October 2001, the owners pulled out of downtown Reno and closed the hotel. 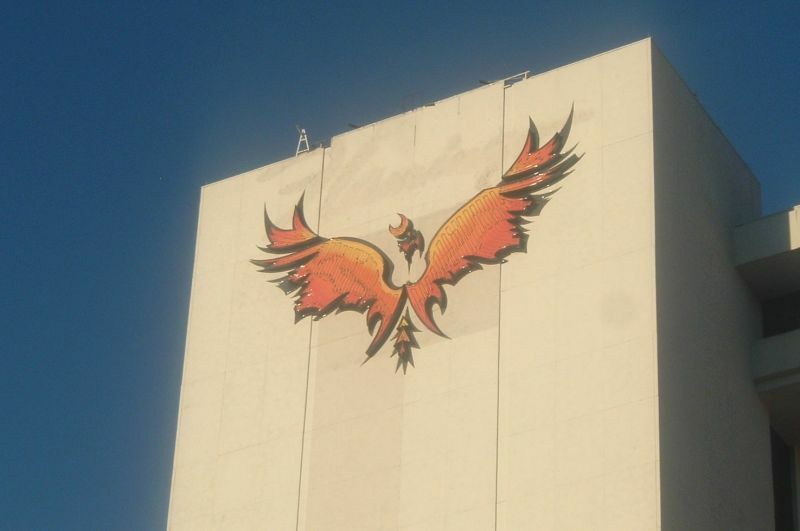 It sat dark for a year before rising from the ashes with new owners, renamed the Golden Phoenix Hotel/Casino. But now, business must not be as good as they hoped because the Golden Phoenix, like so many other hotels, is now under consideration for being converted to condos. That is, if the owners can decide what they want to do. At the top of the tower, behind the giant bird, a ghostly remant of the Flamingo still lingers. This building on 6th Street originally opened as the Reno Hotel, but went through a series of different owners, becoming the Reno Ramada and then finally the Speakeasy Hotel, rethemed as a 1920s gangster hideout. 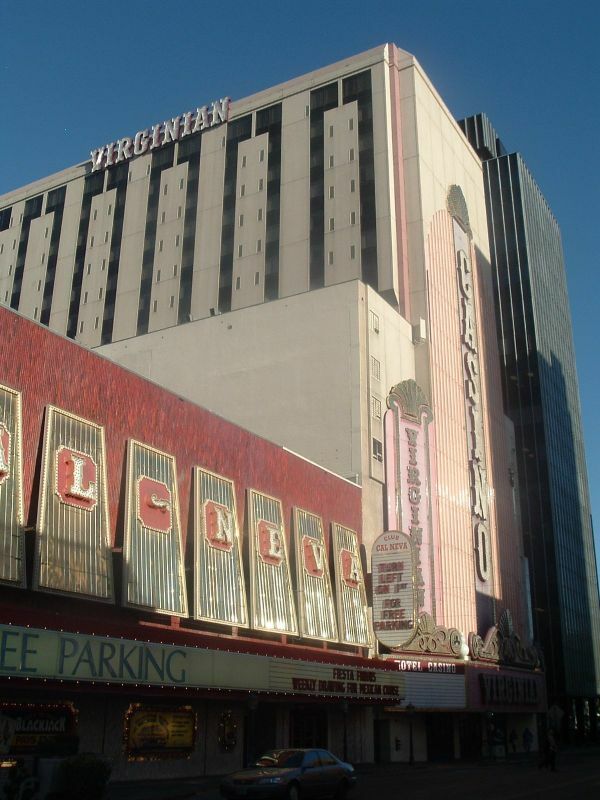 Now the owner plans to convert it again, but in a first for downtown Reno, it won’t become condominiums. Instead the Speakeasy is being transformed into regular, old, monthly-rental apartments. It’s being rechristened The Reno Regency, and work on the outside has already begun. The Speakeasy doesn’t quite have the proximity to downtown and the river as the other towers that are being converted, but it does have the advantage of being the closest one to the University of Nevada, Reno. They’ll probably be shooting for a lot of college students to move in, and they’re not exactly know for being able to afford condos. Another long-time eyesore, in the same part of town as the Sundowner, is the Kings Inn. It has been closed for nearly 20 years(! ), but after spending most of that time in bankruptcy court, a new partner has come on board and they are now ready to cash in on this wild condominium boom. The Kings Inn isn’t in the most desirable part of town. It’s right at the intersection of West Street and the railroad tracks, a part of town that absolutely nobody goes to voluntarily. The Reno homeless mission is right across the street. Your view to the south consists of parking lots and junky little one-story mid-20th-century buildings. Directly to the north is 4th Street, Reno’s Motel Row. Directly to the west is the Sands Hotel/Casino, probably the worst of downtown’s major gambling properties. In short, there is nothing attractive about the Kings Inn or its location that would make people want to buy condos here, but they’re pressing forward with their plans anyway. The only alternative that has been offered is to just tear it down and let the weeds grow. Even the mayor wants to dynamite it. I’d say they’ve got an uphill struggle ahead of them. 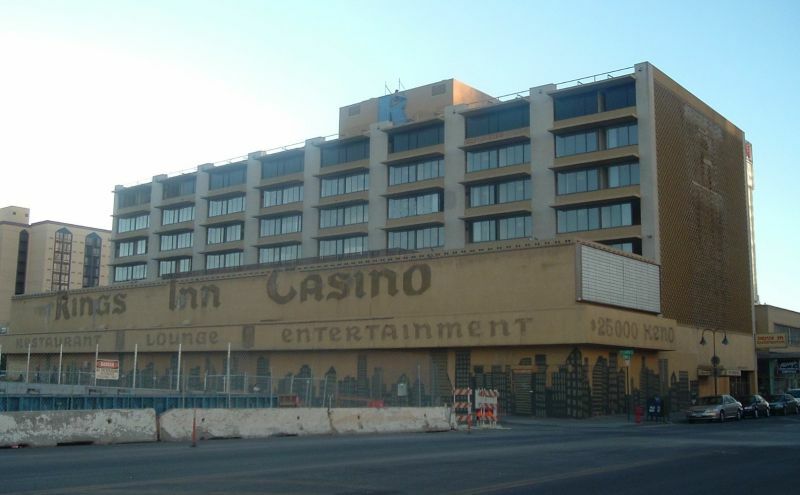 For a look at the Kings Inn before all the neon was stripped off, go to Nevada Max’s site. The Nevadan on August 31, 2005. 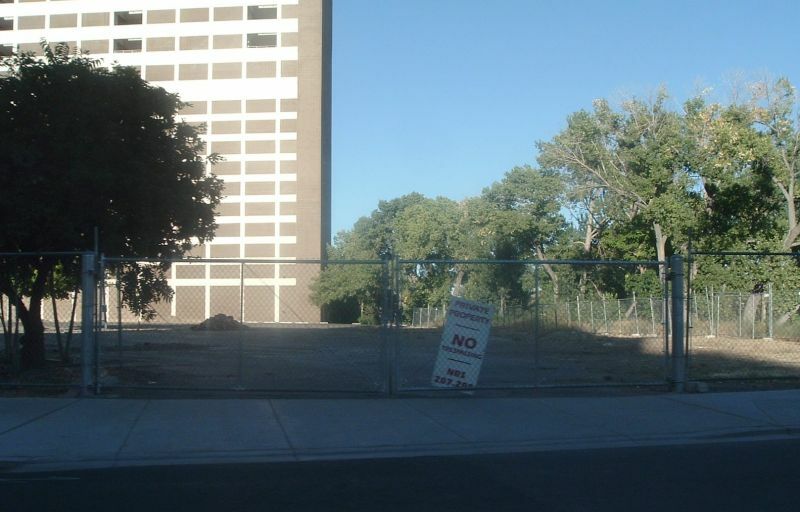 This is the newest condominium project to hit the Reno streets. 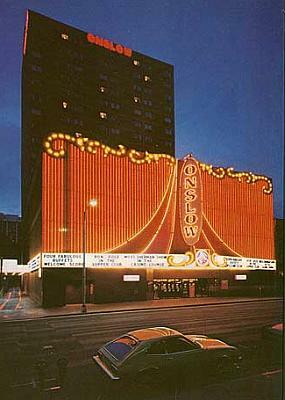 The Nevadan Tower was formerly known as the Onslow Hotel, part of Reno’s “Class of 1978”. 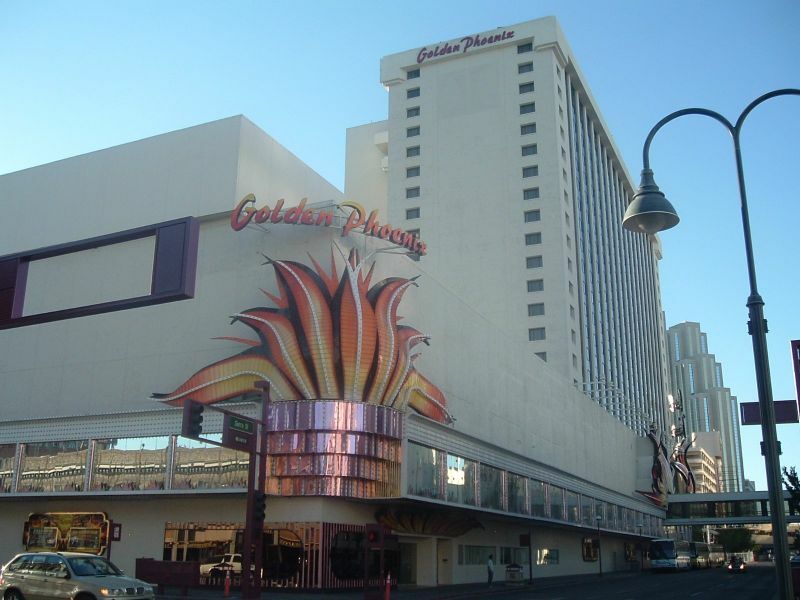 It opened the same year as Circus Circus, the MGM Grand (later Ballys, now Reno Hilton), the Sahara Reno (later Flamingo Hilton, now Golden Phoenix), and the Comstock. It prospered for a little while, but soon went through the usual downtown dance of being sold, closed, sold, reopened, and sold again. The Onslow soon after opening. After the Onslow closed it became part of the Riverboat Hotel/Casino, but most recently it’s been owned by the Cal-Neva Casino across the street, and used as a hotel for their guests. 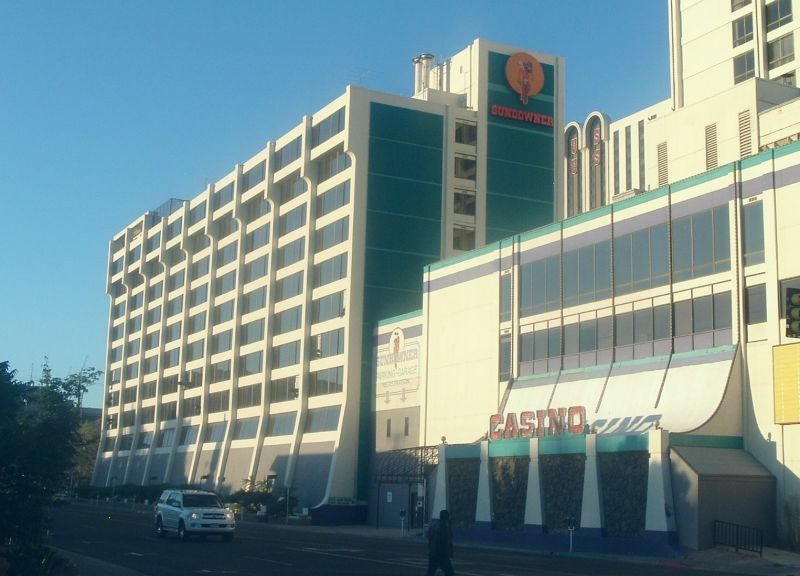 It’s currently operating under the Cal-Neva name, but guests who stay there have to exit the casino, use a crosswalk to get across Virginia Street, and then enter another casino to get to their room. But now a developer is interested in buying an entire half of the block, which includes the Nevadan, a shuttered Woolworth’s next door, and an antique mall in an old JC Penney’s building on the other side of the block, across the street from the Palladio. Cal-Neva seems willing to sell. The new, unnamed, condominium project. And supposedly this tower is haunted. I wonder if the ghosts will stick around for the renovation? 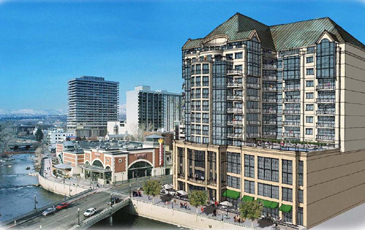 The Virginian Tower, next to the Cal-Neva, hasn’t been announced for condos yet, but honestly, it can’t be long. The Virginian tried to make it on its own, but it ended up shutting its doors in the 90s like so many other downtown properties. The Club Cal-Neva, right next door, saw this as an opportunity to finally get some hotel rooms for their guests, so they leased the building and rented out rooms. 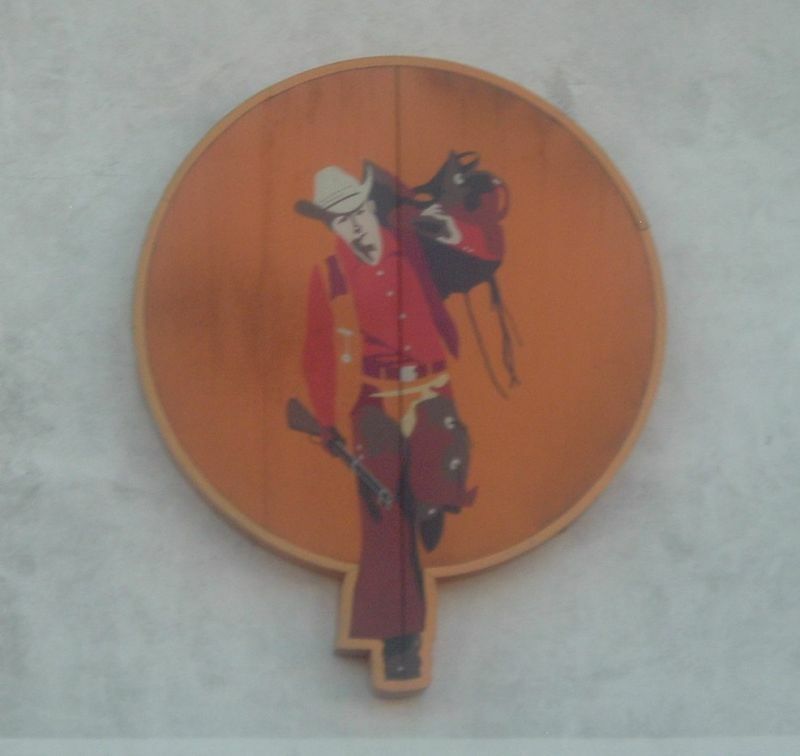 In 2004 the lease expired, and the Cal-Neva was unable to negotiate favorable terms with the owners, so, once again, the Virginian was shut down. Now that they’re selling the Nevadan, the Cal-Neva’s brief flirtation with the hotel business will soon come to an end. The Virginian tower has been sitting shuttered and vacant for about a year now. But with all this condo talk floating around Reno recently, how long do we have to wait before somebody puts forward a proposal for the Virginian? I’ve used a ton of sources for this article, so why not list some of them here? Thanks for hanging in there through all of this! And if you can’t get enough Reno construction news, stay tuned for an article about what’s being planned over at the Reno Hilton. Coming soon! 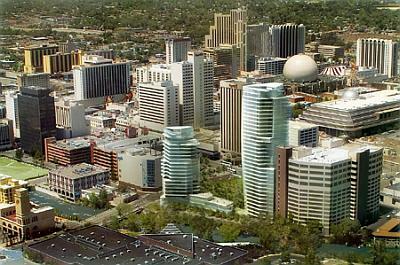 Early/mid ’90s when cal-neva built a new parking garage and skybridge to the east, this broke their grandfather rights for owning a large casino without rooms, so they had a period of time to scare up 301 rooms, hence the Virginian and Nevadan towers! While I agree that the Kings Inn redevelopment is perhaps the most iffy of the bunch I think it is largely because of the nature of the proposal and the quality of the group behind it. The general surroundings, though currently awful, will likely be changing for the better VERY soon for two reasons. First, the City of Reno has purchased the current Reno Sparks Gospel Mission site (across West St from Kings Inn) and also the Catholic dining room site just west of Ralston on Third. These purchases are part of a deal made to build an entirely new homeless care facility just south of 4th street on Record Street – adjacent to St Vincents thrift shop – which is substantially further east and out the downtown area. This new complex is virtually complete and ready for move-in with additional land available for further expansion as needed. The closure of the current buildings and opening of the new facilities (probably within 60 days) should substantially alter the character of the area around Kings Inn. Secondly, the City council just gave the go-ahead for design/build of two “plazas” to cover the new train trench for the two blocks from West Street to Virgina. L3 Development from Chicago has completed the Golden Phoenix deal and will close the casino on Dec 1 to rip it apart for condos. Developers have reportedly been assured by the City that a new plaza cover (with landscaping and fountain?) will be built over the trench north of their building which will mute train noise. Initial condo pricing in the “Montage” (new name for Golden Phoenix) runs from just under to well over $400 per square foot depending upon how high up in the building the condo is located. Combine that with condo fees in the $350-500 per month range and living in a downtown condo is NOT cheap. They are already taking deposits and selling condos in the hotel tower with a full rollout of their other units in the casino and convention areas scheduled for Nov 15. I’m not sure where all the money and people to buy these things will come from, but if real estate in general holds together there will be a LOT of new condo residents in downtown Reno in a few years. Added note – City Council also just approved deeding the diagonal portion of First Street (between Evans and Lake) to the group which has proposed the two new twin glass towers on their properties that are both north and south of that section of street. Deal calls for reversion of the property to the city if development plans are not carried out in a timely manner. Groundbreaking currently estimated for 2006. I just found your summary of all the activity going on downtown. 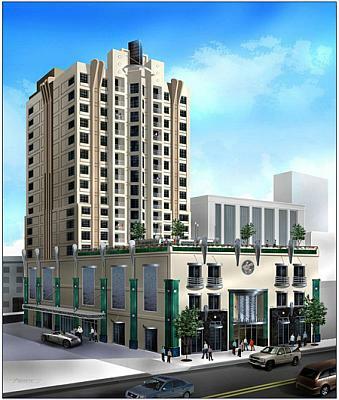 Great work; as a downtown Reno resident (Arlington Towers–we were condos before it was cool!) it’s nice to have all of this information in one place. Of course, you don’t include much information on non-condo construction projects such as the new courthouse, the permanent ice rink on First Street and the train trench, but so much is happening so fast down here these days that it would be practically impossible to catologue it all. And that doesn’t even include recent improvement that we are already taking for granted like the whitewater park on the Truckee, the Nevada Art Museum’s new building and the Riverside 12 movie theater. You’ve done a yeoman’s job by just putting together information on the condo projects. I would hesitate before using your word “renaissance” when describing what’s going on in Reno these days. Although you are undoubtedly correct that a great deal of money is pouring into various projects and there is tremendous potential right now, I have to say that the jury is still out as to whether or not real success and meaningful growth will result from all this. I think the last commentator asked a good question–where exactly are all the people going to come from to fill these hundreds of new condos? Is growth downtown going to outpace real demand? And where exactly is all this growth leading us? I love the convenience and the urban (or at least quasi-urban) lifestyle of living downtown, but I just don’t know that there are all that many people who want to live down here, particularly people who can afford to drop three to six grand on a home. So far it appears that sales at Riverwalk (formerly The Comstock), The Palladio and The Montage (currently The Golden Phoenix) have been brisk, but I have to wonder just who exactly these people are that are buying these properties. Do they look at these residential properties as investments? As second-home/weekend getaways? Or are they actually people who actually live and work in Reno and want to make downtown a thriving community and a great place to live? And where are these middle to high income residents going to work in a town who’s industry has always been heavily oriented toward low-wage service industry jobs? It’s also important to keep in mind that downtown Reno still has a lot of problems, most notably parking availability, vagrancy, crime and a general reputation for sleazyness. Just a couple of months agoe we had a police officer shot through the face outside a bar that is literally a block from the Riverwalk, which will be the first of these new condo projects to start moving peole in. Not to try to sound melodramatic, but aren’t most people going to pause before spending $400,000 for a home when law enforcment officers are being shot in the street outside? No one wants to see this area grow and thrive more than I do, but we have to be careful how this growth is managed and we have to deal with a lot of other problems before these projects can be successful. The last thing we want is towers full of unlived-in condos blotting out the sun. All that downer stuff being said, I am optimistic. I think that in two years, downtown Reno will hardly be recognizable compared to what it is today, let alone what it was two years ago. But there’s a long way to go yet.